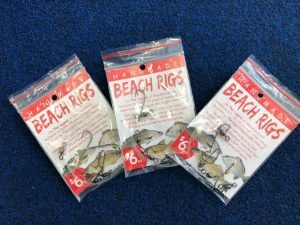 Today I am discussing catching whiting from the beach and will touch on my tackle set-up the most successful rigs & methods, best times, best places and best baits to use. This is by no means exhaustive in content although, what we will touch on today has been more than successful over the years. Whiting are in greater numbers on the open beaches from about November through until about March, during this time they leave the protection of the estuary system and travel on their spawning run. 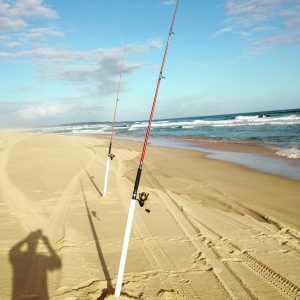 The peak months for me have always been Dec-Feb. My favourite time fishing from Birbui end of Stockton Beach is December. Both Fingal Spit and One-Mile also fish well. Fish during this time are rowed up and on top condition. For the most part whiting are a morning feeder, by morning I am referring prior to sunrise. 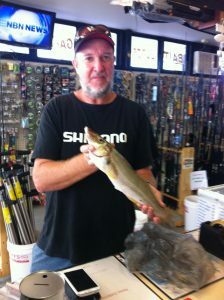 You will of course take whiting during the day although not as many. 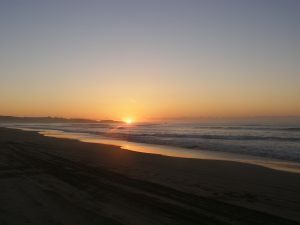 The best times I have found are before the sun rises and sets, overcast mornings/days offer cover as does white water. At times whiting will bite into the night. Traditional I’m fishing (baits in the water) at 430am-5am. Water temperature is important, warmer is better. As the tide rises, the whiting move out of the gutters and holes and move onto the banks feeding along the intertidal zone. I fish with a simple paternoster style rig, made of 20lb. fluro carbon, size 4 baitholder style hooks, number 8-10 ball sinker which I have inserted a stainless-steel ring into which allows it to fit into the snap swivel at the bottom of the rig. 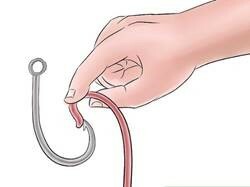 I have 2 single leaders with hooks which are attached to a swivel held by a loop from a dropper knot. The dropper knot swings around on itself, using 20lb. 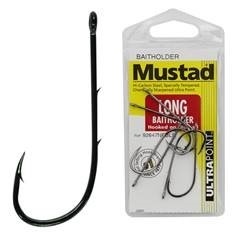 allows for less twist and small knots in the leader. At times whiting can school in large numbers, hence have 2 hooks can be an advantage as it’s more than possible to take 2 fish at once. Don’t cast over the fish, during the hour’s darkness (Early morning or night) the fish will hunt close in, through the intertidal zone searching for pipis and worms. I simply set 2 rods out in rod holders, whiting will hook themselves. Although if the fish are on I hold the rod. For rod holders I simply use PVC approx. 1.5 m each with one end cut on an angle allowing it to be hammered into the sand with a rubber hammer. 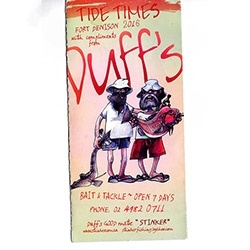 I’ve lost a few rods over the years so get it at-least half a metre into the sand. Always check the holder when fishing. Move them up as the tide comes in. 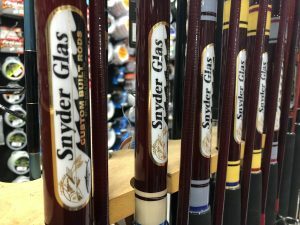 To increase your chances of double hook-ups, wait, if there is a fish hooked then let it shake and move the rig around, often the next fish will grab that spare bait that’s flying around. When it comes to whiting and bait, there’s no comparison to the beachworm. It’s basically common sense, beachworms live on the beach and whiting feed on the beach. Either in a live form or metho (preserved) beach worms are an A1 whiting bait. Yabbies would be my next choice when the conditions are suitable, then a pipi. You will catch whiting on pipi’s although if you catch 5 then I’d suggest using worms you’d catch 10. When putting the worm onto the hook, thread on head-first, thread up and over the eye of the hook and break off just above the point of the hook. If using live worms roll in sand first which will give you grip. Threading the worm on head first will avoid it from breaking up. 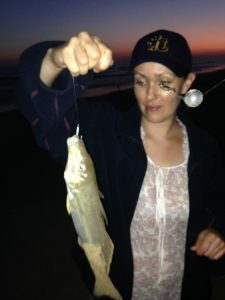 Whiting are considered a top-class table fish and in my view one of the best eating fish in the ocean. Upon capture I dispatch the fish by breaking its neck, quick and in my opinion more humanin. Simply scale, gut & gill. In the fridge for a day or two before filleting. Re-wash fillets in salt water then eat fresh or freeze. Whiting fillets come out of the freezing process well without loss of quality.